Here’s a look at what Sears will be offering on Black Friday. There is a $10 coupon good towards $30 worth of clothing or accessories but that’s going to be about it. The first 200 people to purchase clothing will receive a free Thomas Kinkade Ornament. Sears will open at 4:00am on Friday. 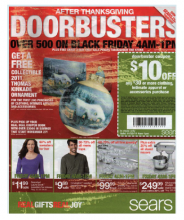 Here is the Sears Ad for Black Friday so you can get a head start on your list. Very disappointing that it’s mostly clothes this year. Stores Nov 12, 2011 in BlackFriday, Sears · Expired!